MRA Digital’s ObjTrack-11 FPGA IP core implements the algorithm of automatic tracking of objects in video and calculation of their parameters for solving guidance and target designation tasks. 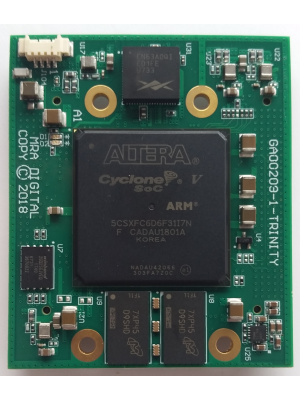 ObjTrack-11 IP core is a stand-alone module easily integrated into projects based on field-programmable gate arrays (FPGA) and application-specific integrated circuits (ASIC). The core interfaces are standard and allow for connection to IP cores. The use of the ObjTrack-11 IP core will allows you to create your own effective machine vision systems for solving problems in fire control, weapons guidance and perimeter control with a significant reduction of the development time. Tracking up to 80 fps at core clock frequency 300 MHz and object size of 128x128 pixels. The library implements 1 tracking channel. If several channels are required, several cores need to be used. Tracking of objects is possible in the size range from 8x8 to 128x128. Channel parameters can be changed in times of tracking. Tracking is possible for all types of objects of any shape. There is no tracking collapse if up to 50% of object area changes over no less than 50 frames. Tracking when an occluded overlaps up to 50% of object area. Tracking collapse is automatically detected and the object is re-captured after detection. Discreteness of coordinate calculation is not less than 1/256 pixels. Discreteness of motion speed calculations is no less than 1/256 pixels/frame. Tracking of dynamic objects. Possible translation of object over 1 frame is by 52 pixels in any direction. Tracking of low-contrast objects against a complex background. Tracking of objects with a contrast from 10% is possible. Calculation of the position and size of object in the tracking rectangle. It is possible to resize the strobe without tracking collapse and object re-capture. Adaptation is possible to your conditions of use (changing of operation modes, control logic, algorithm modification). Easy integration. The core is supplied in a form convenient for use in FPGA IDE systems by leading FPGA manufactures.